Comment: Main skill for chasing you can consider this as a nuke, im gonna teach you how you can combine this skill with Haunt to finish an enemy hero. Reduces and causes any damage taken by Mercurial to be reflected onto all enemies in a 1000 AoE. Level 1 - 5% of damage. Level 2 - 10% of damage. Level 3 - 15% of damage. Level 4 - 20% of damage. Comment: Good skill against channelers like voljin rylai we are going to max this first for defensive purposes. Deals bonus damage that cuts through armour when attacking a hero that has no nearby allies. Works on Illusions. Comment: This Skill is all about hero killing this is what makes Spectre a good Solo hero. Creates a haunting image beside each enemy hero. These images are uncontrollable, take 200% damage, deal 40% damage and each of them will attack only its pair. Images also have the dispersion ability. Cooldown goes down with level. Comment: Your Ultimate skill this can finish off heroes with 1/4 health this skill is a free maphack. Use Reality to transfer with your illusions and use spectraldagger for the win. Self Explanatory Bracers give good Hp rather than wraiths. Boots is always needed by any hero. Chickens are for faster transport. Ring of Regeneration is for hp recovery. Tangoes are for Hp recovery since Spectre is very fragile. We wont be getting Ring of Bassilus since we wont spam Spectral dagger keep that in mind ok.
1.Find a 1/2 health hero that you can take on. 2. Quickly Cast Haunt and let it have a few whacks. 3. Reality Next to him/her little mor whacks then spectral dagger for the win. 2.Haunt Few whacks then Reality. 3.Spectral Dagger and You or your team mate should have a kill. Her role is simply to slow a hero or Haunt a hero for thier location but more importantly she is a hero assasin herself. With Diffusal and Spectres Attack speed farming will be a breeze for her and so is Ganking. In early game you and your team mates should have taken down all Lvl1 towers in Mid game pushing is the key of winning.Dota players tend to forget this and brag about killing rights remember 1000Kills and 0 deaths dont mean a thing if your Frozenthrone/World tree is destroyed. Pushing will be easy lane with an ally and start pushing towers fast, 2-5 minutes is the common time of pushing while nobody is defending. Your Pushing should attract some attention and they will defend so what do you do? Use your improved Killing and Ganking Skills. 4.Purge and chase this should give you or your team mate the kill and expierience. 2.Removing Skills doom poison etc. 3.Solo Kill or Team Kill. Remember to finish all the charges before upgrading to manta since all charges count. 1. Vanguard has a nice synergy with dispersion i usually get this to boost Spectre's Hp after getting Manta this isnt hard to farm. 2. Tarasque this is for tanking or incase you dont get Vanguard. 3.Buriza This is for damage since Images bennefit from Crits. The only Tip i can give you is stay with your team mates because all of your enemies have good items or completed thier core itmes so be careful DYING IS NOT FUN IN LATE GAME. 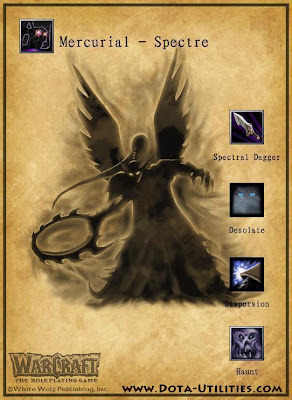 Spectral dagger is your nuke and chasing skill, Dispersion is for Defense, Haunt in level 6 can net you first blood and desolate is effective mid game. May i remind you Spectral dagger is also for escaping. Why not desolate in Early game? No because do you expect that you can kill an enemy with out help from your ally in early game Desolate is only i reapeat effective in MID to LATE game. Manta has good synergy with your ulti and images bennefit from feed back and be aware they images has Dispersion and desolate not to mention they have increase speed when using Spectral dagger. Eos is too much expensive dont get int items you wont need it Mjolnir i dont like it even with increased IAS Midas is also a waste of time and gold. You can get this if you have time and gold. Spectral dagger gives you zero collision, this means you can move like ghost imagine moving to a cliff by passing through it. At my recent activity i found out a way to use Spectral dagger for escaping effectively example, Spectre uses the spectral dagger to escape through a cliff. This is possible how you ask by shift clicking. Yes you can use Shift clicking for escaping its easy press shift and right click you will see some marks yes marks like a spear mark where you shift click sounds confusing eh but you should try. I suggest practicing in your fountain first Shift clicking makes spectre do a diffrent approach in moving. How do you master Shift Clicking? The easiest way to master this is to practice it in the fountain, You see the big rock in your fountain Use spectral dagger there and shift click spectre should move through if you made a mistake Spectre will go around the rock. Try it on diffrent areas on the map so you can get a hang of it. What are the skills that Dispersion disperse? Note: She can disperse this skill nulling them or she takes less damage. Early game nukers and Heroes that can out last you. I hope you learned something from spectre she isnt your average hero i hope people get to play her more often. Dota strategy for making this guide. To all dota players out there keep rocking \m/. I will update this from time to time and post pictures to since our internet speed is slow and get bad lags in Gg client or battle net so i am forced to play outside.